Meek and mild. Politically correct. A great teacher. These are the popular depictions of Jesus. But they aren’t the complete picture. Maybe because it’s uncomfortable, or maybe because it’s inconvenient, Christians and non-Christians alike are overlooking the fierceness of the Savior, His passionate mission to make the Gospel clear and bring people into the Kingdom of God. A mission that required he sometimes raise his voice and sometimes raise a whip. In the much-needed message in The Jesus You Can’t Ignore, renowned Bible teacher and best-selling author John MacArthur reintroduces the compelling and often unsettling passion of Jesus’ ministry. MacArthur points to the picture of the real Jesus the world is so eager to gloss over. And he calls readers to emulate Jesus’ commitment to further the kingdom by confronting lies and protecting the truth of God. 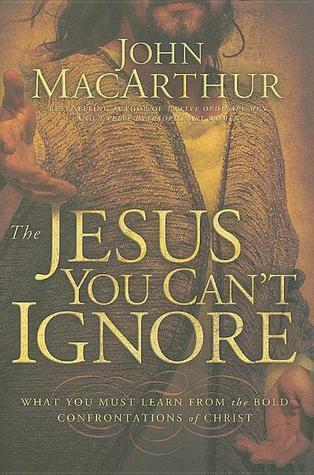 Then I read The Jesus You Can’t Ignore: What You Must Learn from the Bold Confrontations of Christ by John F. MacArthur Jr. and realized that Jesus took the Wanna Be Startin’ Somethin’ approach, at least when it came to the Pharisees. The verses here refer to Luke Chapter 6. Once again Jesus deliberately did something He knew would cause friction. Fully aware that the Pharisees were watching Him closely and that they would be deeply offended if He healed this man on the Sabbath, Jesus brought the man to the front of the synagogue and made the healing as emphatically public as He could. He even proceeded the healing by openly challenging the Pharisees’ error. “I will ask you one thing,” He said. “Is it lawful on the Sabbath to do good or to do evil, to save life or to destroy?” (v.9). Luke suggests that Jesus then made deliberate eye contact with each of his ecclesiastical adversaries just before He healed the man: ‘When he had looked around at them all, He said to the man, “Stretch out your hand” (v.10). He also portrayed them as sounding a trumpet before them when they did charitable deeds (v. 2). There’s no record in any of the literature from that era where anyone actually held a parade with trumpets when they did their alms. Jesus was painting a colorful word picture, actually making a humorous parody of the Pharisees’ spiritual flamboyance. He was using sanctified mockery to expose the silliness of their system. By the standards of today’s overtolerant evangelical subculture, such satire would be deemed a mercilessly cruel way to point out the faults of one’s adversaries. But again we see that Jesus was not bound by postmodern scruples. There were clearly aspects of the Pharisees’ doctrine Jesus could have singled to declare He had some “common ground” with them. There was much positive energy in the initial eagerness of the crowds who followed Jesus. He might have harnessed that and doubled or tripled the size of his congregation. He did not do that. He did the exact opposite – deliberately. Again, He was not interested in increasing the ranks of half-hearted disciples. His preaching had one aim: to declare truth, not to win accolades from the audience. For those who were not interested in hearing the truth, He did not try to make it easier to receive. What He did instead was make it impossible to ignore. Of course, Jesus still knew their thoughts, and He confronted them more directly than ever before. He used some of the sharpest language He ever employed. He called them names. He let loose with waves of condemnation against their hypocrisy, their scripture-twisting, and their self-righteousness. He pronounced woe after woe against them. And the expression “woe” was no mild imprecation; it was the strongest conceivable prophetic curse. And you can be certain it’s meaning was not lost on them. There is a section that I’ll mention just because I love the title, How to Lose Friends and Inflame Enemies, classic. We can learn a lot from observing how Jesus dealt with false religion and its purveyors. The boldness with which He assaulted error is very much in short supply today, and the church is suffering because of it. So when asked to describe Jesus, I can start with gentle, merciful, but I won’t stop there for He is so much more.